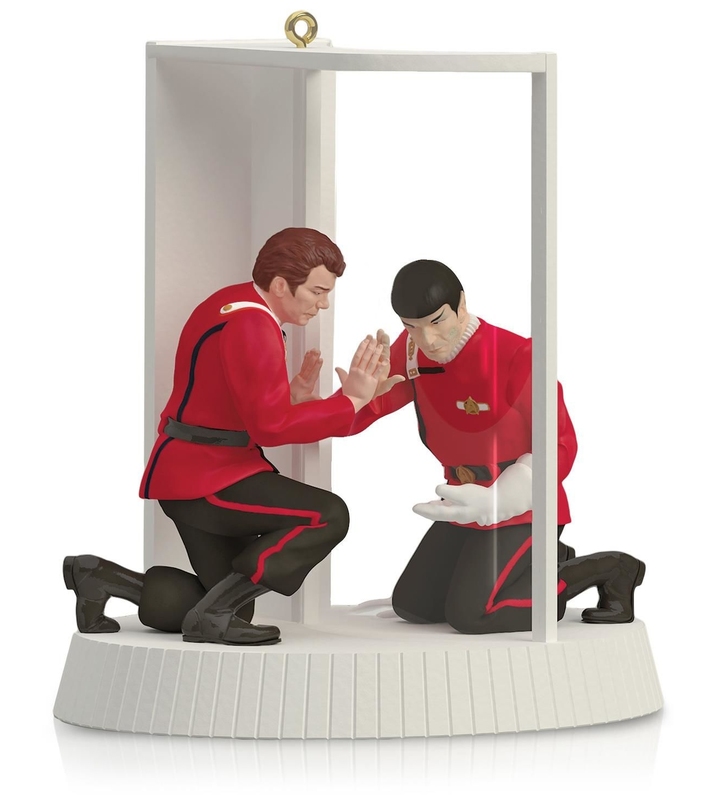 Hallmark have updated their website with listings for their three Star Trek Keepsake ornaments for this year. Their listings include much higher resolution versions of the previously released images of all three designs, plus previews in other media. Continue below to check out the range. In-keeping with their offering for the past few years, the three ornaments continue three distinct styles of decoration. There is a starship, which this year is the USS Enterprise-C. The model is just short of five inches long, and features a battery powered light feature, which you can see demonstrated in a video on the Hallmark website. There is a recreation of a scene, for the second time since this range began in 2004, we get a moment from The Wrath of Khan, this time the death of Spock. As is typical of this format, there is also a sound feature, playing out the dialogue between Kirk and Spock, and you can listen to that on the Hallmark website too. And finally there's a single figurine, from the ongoing Star Trek Legends series. Lieutenant Nyota Uhura will be the sixth character in that range, which now includes almost all of the main TOS crew. However the Hallmark website notes this will be the last in this series, leaving poor old Chekov no place on the Christmas tree! I have many of the Hallmark ornaments, but am I the only one who thinks that a Christmas ornament displaying the death of a Trek character just doesn't belong on a Christmas tree? My friend at Hallmark is gonna tell me why it's the last in the series at Comic Con. I was very vocal when I heard this as it leaves me with YET another incomplete crew. Way to go Hallmark! They also have big plans for Trek's 50th next year,that I'm hoping to hear more about that at Comic Con. Maybe they'll have some of that on display,their Sneek Peak thing.